very clean , very organised , very friendly stuff . I like the quiet neighborhood it is in. Staff seems to be a bit shy to speak English. There is a 4 burner stove but only 1 person can comfortably cook at a time but moving the stove just 1 feet closer to the sink could make it comfortable for 2 people to cook at the same time. Shower has great water pressure. 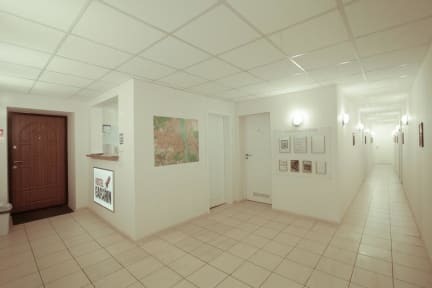 Very nice staff, good common area to meet people . It's near the metro but 30 minutes by walking or by metro to center . They let me do my laundry no cost , assisted me in buying my bus ticket . Staff also speaks really good English . Nice stay. Value for your money. Som dirty guests, but that's not gar'is fault. Recommend. Hostel located in a quiet area, not far from the tube station Kloschka, shops are also close by. Most of the guests were locals, I speak some Russian however I had the feeling that they could not speak English, so not much exchange, pity. Hostel keeper OK and friendly. Pretty decent hostel with nice hot showers. A little bit out of the way from main attractions, but also relatively central at the same time. Hostel staff were very nice and helpful, but there didn't seem to be any sort of backpacker/traveler atmosphere, as most of the guests seemed to be locals and there weren't many, if any, organized group activities. It is not nice backpackers hostel. It's more like for people working in Kiev or people who e.g. missed their trains. Anyway, it was ugly and dirty. Not that it wasn't cleaned or linen weren't changed. But lady seemed to just clean floors. So e.g. I put my phone on used chewing gum left on shelf by previous guy or there are spider webs on walls, "white" light switches, walls, and doors are in fact greyish because of usage. Worst was the toilet: smelly, dark, crammed. So for #2 I went to city. 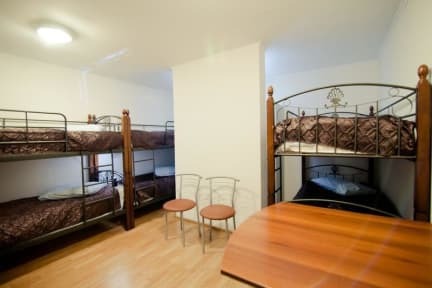 This doesn’t seem like a hostel for backpackers - it’s full of migrant workers from Russia and Central Asia working in Kiev who live in the hostel permanently. They do not seem happy when a traveller turns up in their home, I felt pretty unwelcome. Although I booked and paid for three nights I left after one. Central location though.